A hearty way to start the day! Enchiladas are such a popular meal at our house that I recently decided to create a breakfast version. My timing was perfect as we had a houseful of overnight guests and I wanted something tasty that I could assemble the night before, then just pull out of the fridge and pop in the oven. This dish is so easy to make and everyone who’s tried it just loves it. You can swap in chopped ham or crumbled, cooked sausage meat for the bacon if you like, or swap in black beans for the meat if you prefer, for an equally delicious vegetarian option. Lightly grease the bottom and sides of a 9 x 13 inch (22 x 33 cm) baking dish with canola oil or cooking spray and set aside. In a medium sized bowl, combine the bacon and green onion; remove 1/4 cup of this mixture for topping the casserole and set aside. Add 2 cups (500 mL) of the grated cheese and the diced tomatoes and stir to combine. In a second medium sized bowl, whisk together eggs, cream, milk, salt and pepper. Set aside. Spread about 1/3 cup (90 mL) of the bacon, onion, cheese and tomato mixture in the centre of one tortilla (form a line with the mixture) and roll up the tortilla to enclose the filling. Place into the prepared baking dish, seam side down. Repeat with remaining tortillas and filling. 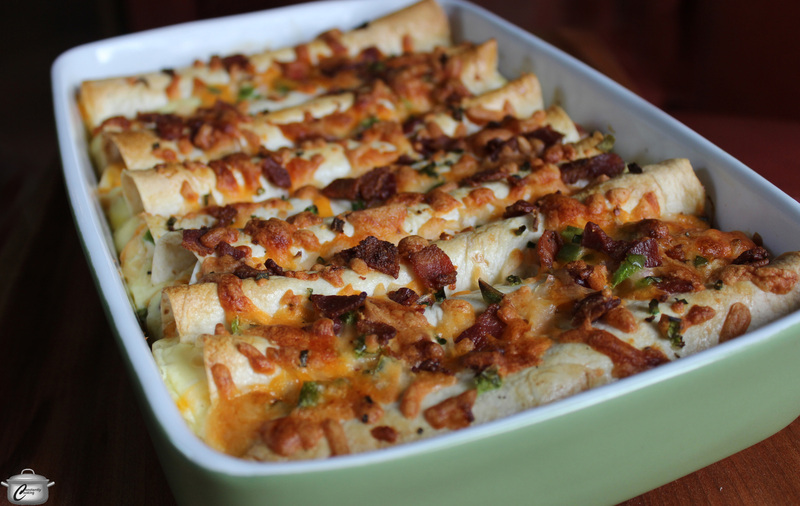 Pour egg mixture over the top and then scatter reserved bacon and green onion mixture over the top of the tortillas. Cover with foil, and store in fridge for up to 12 hours, until ready to bake. Bake at 350 degrees for 30-40 minutes until eggs are set (jiggle the pan to check). Remove the foil, top with remaining 1 cup (250 mL) of shredded cheese, and bake about 5 – 8 minutes more, until cheese is completely melted. Serve hot, passing sour cream and salsa at the table. 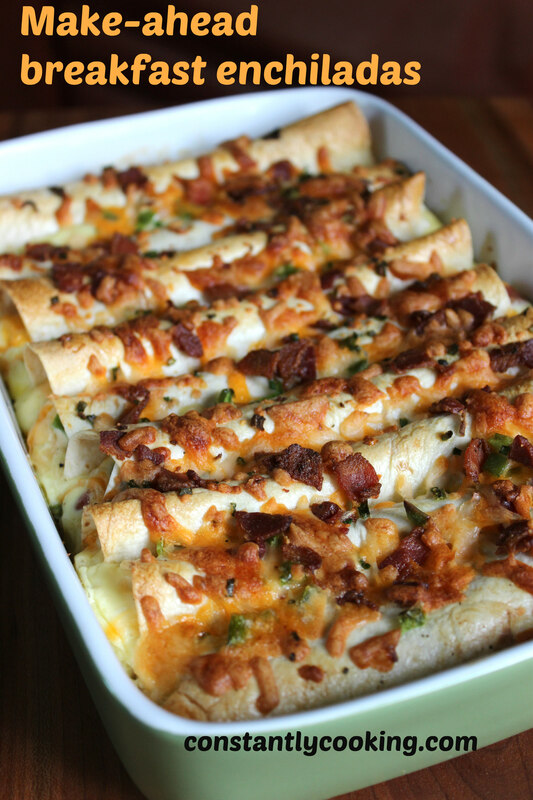 This entry was posted in Breakfast, brunch, easy Mexican dish, easy Tex-Mex dish, eggs and tagged bacon, eggs, eggs for a crowd, enchiladas, good breakfast for a crowd, make-ahead breakfast, tortillas, what to make for breakfast, what to make instead of huevos rancheros. Bookmark the permalink. Pingback: 100 Reasons To Not Kill Yourself: #61. | You've Been Hooked!